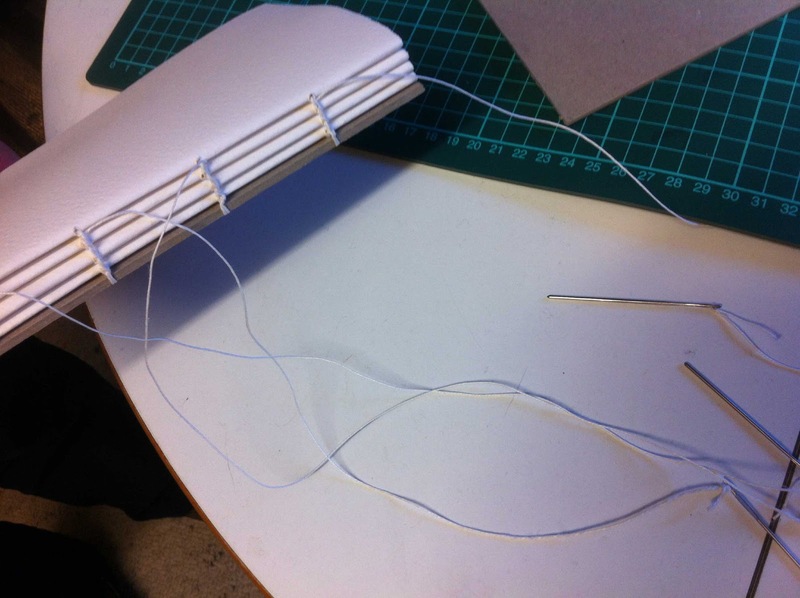 I've just spent a most enjoyable afternoon helping my artist friend Ray Maclachlan make a new sketchbook. 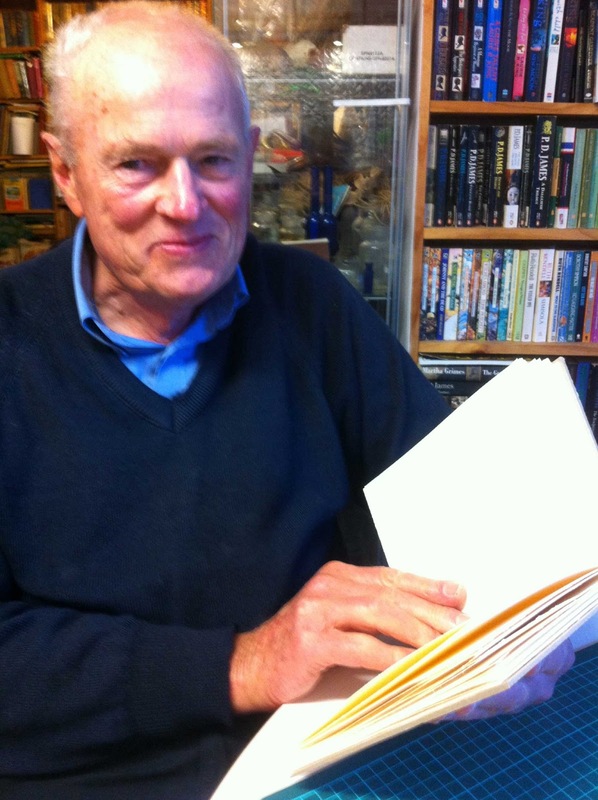 [Do look at Ray's blog, not only because his water colours are delightful, but also because he paints on the NSW Central Coast, where I live. So if you are wondering just how truly gorgeous it is here, check out Ray's paintings.] Back to the sketchbook. I decided we should make a coptic and for a while there I think Ray thought it was just too fiddly, but he quickly got the hang of using four needles at once and with a lot of laughter we managed to get the book finished in two hours. Above, just waiting to attach the back cover. Below, Ray with his new sketchbook. Ray will cover the bare boards with some of his water colours. 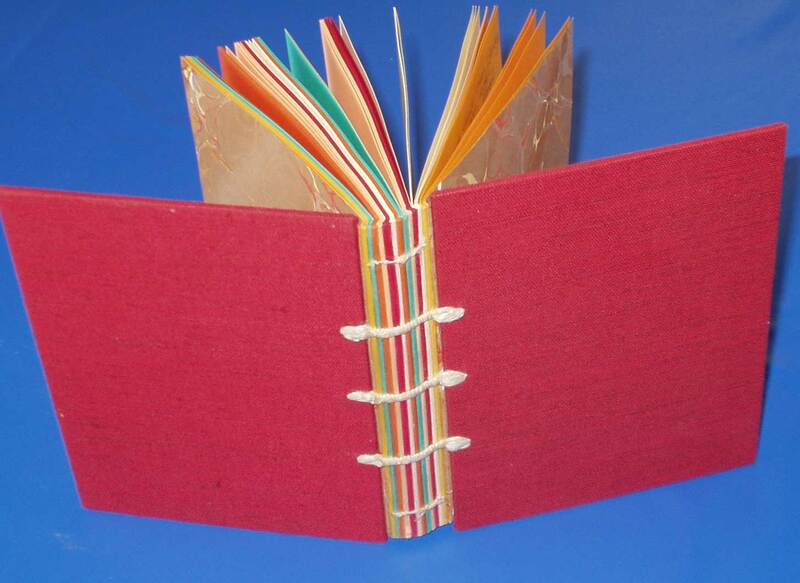 While I'm showing you Ray's book I'll add one of mine from the very early days of my binding career. 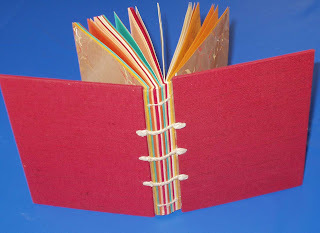 This one was given to my very dear friend Jen, who has used it for many years as a visitor's book, so I'm able to watch how it is holding up over the years. Very well, I'm pleased to say. In a few days I'm starting Keith Lo Bue's on line workshop Poetry in Motion, making mobiles and stabiles in the style of the wonderful Alexander Calder. Do check out this link. In preparation for Poetry in Motion I've been sorting all my metal working equipment and gathering bits and pieces to use. 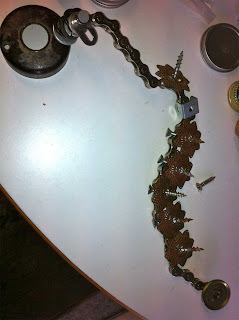 Scraps of metal, plastic, wood - and I've bought some plastic dragons to try to make a mobile for Eddie. Though that's a secret, okay? Sophia took a great interest in the metal bits/junk, and asked could she make something, saying she thinks she wants to be an assemblage artist! Gosh, so do I! It is, of course, a dragon. Dragons and dinosaurs are the animals of Eddie's choice. As quickly as he'd made it Eddie dismantled his dragon and was off to do some drawing. Lucilla announced that she was going to be an artist who paints. No metal for her. 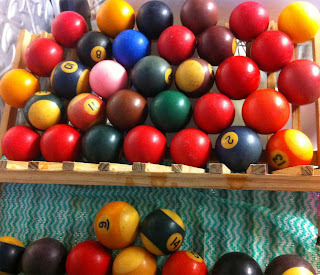 Part of my recent "loot" was a $2 bucket of really dirty balls - billiard, pool, snooker? Not sure, maybe all of them. 51 balls! Now I'm trying to decide what to make of them. We've recently had a couple of weeks of torrential rain and down in the Royal National Park the birds were sodden and bedraggled. The girls don't like to feed the wild birds but during this dreadful weather they relented as the Sulphur Crested Cockatoos and Rainbow Lorrikeets clustered around their door, looking pathetic. Notice the two Rainbow Lorrikeets perched on the chair on the back left - they were absolutely soaked. 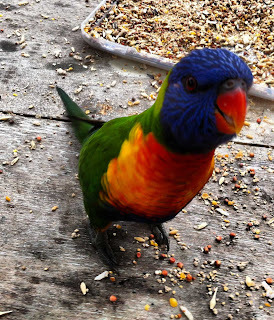 They had their turn at the seed after the cockies were chased off. Here's another little fellow from that day. A Rainbow Lorrikeet with attitude. How lucky are we to have such stunning birds around? That's it for now. 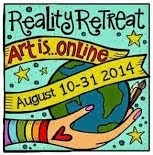 If you'd like to follow me on Pinterest I'm there under Carol Cantrell. Lots of books, paper arts, assemblage and of course, dogs. Yes, you do seem to have put up a "loopy" video. It's very rapid, too, so you'd probably do better with a simple photo. Nice try. Rubbish result! Probably something technical.But the dragon looks good.Great that the kids already have ideas.And the balls? Buy a table and some cues! Di, we actually have a pool table, in the shed waiting for the outdoor room to be built. Everything happens here eventually... 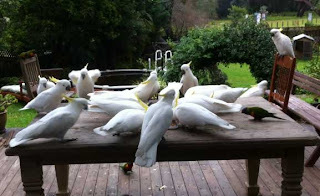 I think I'll capture a screen shot of the cockies and replace the video, just a bit too much colour and movement there. A most enjoyable afternoon Carol. Thank you very much. The book looks great. Very easy when you have such an excellent teacher. Thanks Ray, it also helps to have a quick and able pupil. what a great post Carol, love Eddie's dragon & will be interesting to see what you do with all those billiard balls! My brother wanted to buy his own house so he could pave the driveway in marbles but he built where it snows & decided against putting the dream into reality! Mo, I'm still pondering the billiard balls. I love the idea of the marble driveway - does your brother already have the collection of marbles? Shame about the snow. Many thanks for introducing us to Ray; lovely work from both of you. Quite a buy on the balls; interesting to see what you do with them. Sandra, I'm enjoying Ray's blog with the beautiful paintings. Somehow seeing local scenes in watercolour adds to my appreciation of my surroundings. So pleased you liked them. Looking forward to your 'Poetry in Motion' results, I love the idea! Ersi, so am I! So far, over a week into it, I've been away from home a lot and when I've been at my work bench all I've managed to do is break tiny drill bits! But the course is wonderful! B, Keith's lessons are so informative and entertaining! I'm really enjoying it all except that I keep breaking the drill bits, which are quite tiny. Feeling very klutzy! I thought I'd posted a comment the other day but no sign so I must have done something quite different. 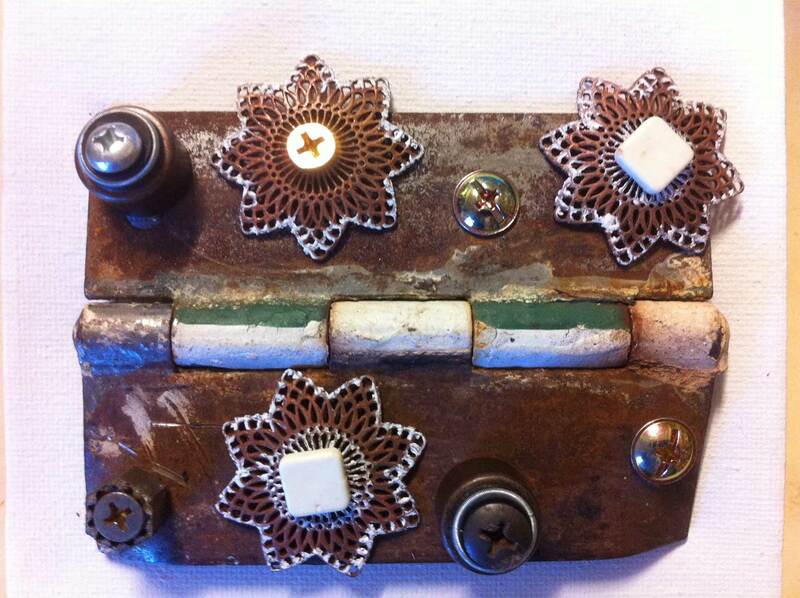 I'm enchanted by your dragons and assemblage. Loved the cockatoos also. So, I finally had time to visit your blog last night at about midnight. I was snuggled up in bed under the covers, reading away, loving the birds and the lovely coptic binding......and then Craig turned off his light (meaning it's time for BOTH of us to go to sleep). I started typing a comment furiously and heard him mumble something totally unintelligible....I kept typing.....clickety clack, clickety clack. He was not amused! I didn't want to take the time to go to the settings and silence the typing, so I just kept typing. Finally finished my lovely comment, hit the publish button, and darned if it didn't ask for my Google id! Jeesh!!! I had no clue what my id was, so I turned off the iPad and fell sound asleep. I did want to tell you what a lovely post this is. 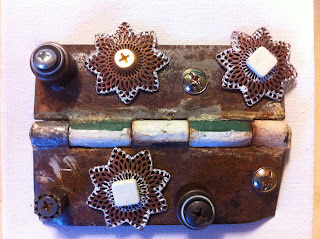 I absolutely LOVE Sophia's assemblage! What patience she has to paint all of that white detail work! And Eddie did a great job too!!! You must be so proud of your cherubs! ...and I will look you up on Pinterest! Judy, welcome back! Don't you just hate that ID demand? Thanks for persevering and please tell Craig I send my love and apologies. Must see if you're on Pinterest too. Hi Paul, I'm so pleased you love Ray's paintings as I do. I'll have to ask him about the sketch book. I'll let you know.